Who’s ready to get firm, sleek, good looking abdominal muscles? Easier than you may think, with the right plan. Pre-Holiday Workout #1: Full Body Bootcamp Blast! Let’s get ready for the Holidays with our SML Pre-Holiday Workout series. Watch Shannon’s video to look better, feel better, and have fun! 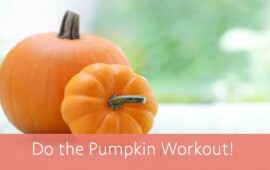 Get into the fall season spirit with these fun and healthy pumpkin workout routines. Grab your pumpkin and let’s get started!